You will be given a reference e-book to read which has 430 pages And the test will be based on that e-book , you can take final test within 1 year of purchase. CSS which stands for Cascading Style Sheets refers to a kind of style sheet language which is primarily used to describe the formatting and look or presentation semantics of documents that are written with the help of markup language. It is usually applied to styling web pages that are written using XHTML and HTML. Note, however, that its application is not only limited to XHTML and HTML. You can also expect to use it to all kinds of documents that use XML such as XUL, SVG and plain XML. One of the major functions of CSS is to allow the contents of documents using the HTML markup language or anything similar to it to be separated from the presentation of documents including vital elements like fonts, layout and colors. This type of separation is usually needed because it works in improving the accessibility of contents, enhance the flexibility in the presentation characteristics specifications, obtain an easier time controlling the specifications, allow numerous pages to easily share the formatting process and significantly reduce the repetition and complexity usually experienced in structural contents. Another of the major uses of CSS is that it allows you to easily present similar markup pages in various styles for various types of rendering methods including by voice, in print, tactile devices, based on Braille and on-screen. It also allows you to differently display web pages based on the size of your screen or the specific device used in viewing the page. 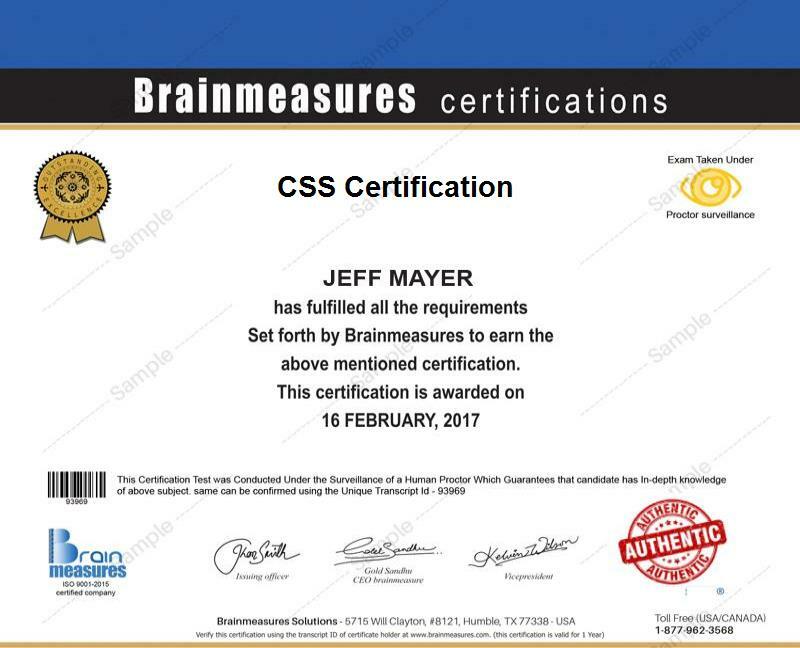 If you want to increase the level of your understanding about the Cascading Style Sheet (CSS), then it is advisable for you to consider taking part in the CSS certification program which you can now easily access at Brainmeasures. Brainmeasures has already proven the online certification industry that it is capable of offering the most remarkable and effective online certification courses so you have a hundred percent guarantee that you will learn nothing but the best by enrolling in its CSS course. The good thing about this certification course is that it comes with a CSS training which is well-thought out and well-defined so expect to have an easier time understanding the major concepts linked to Cascading Style Sheets. This CSS certification course will definitely help raise your awareness about the major uses and functions of CSS, the vital steps and procedures linked to learning and using CSS on any available software, the most remarkable features installed in CSS, its major specifications and drafts and the most useful authoring tools designed for CSS. By successfully completing this CSS certification course, you will be able to take a hold of your certificate which shows how effective you are as a Cascading Style Sheet user and expert. Enrolling in the CSS certification program which is introduced and offered by Brainmeasures to the public is indeed a wise move in your attempt to gain a clearer understanding and a stronger background about Cascading Style Sheet. The certification course is also extremely beneficial for anyone who wishes to fully understand CSS so they can easily maintain, develop, design and establish websites with ease and more confidence. A higher salary is also provided to CSS certification holders. As a CSS certification holder, you will have an easier time grabbing the position of a CSS technician which gives you the opportunity to earn around $46,000 to $72,000 yearly. Working as a CSS consultant from a highly reputable company also allows you to earn a higher salary which usually ranges from $78,000 to $100,000 per year.